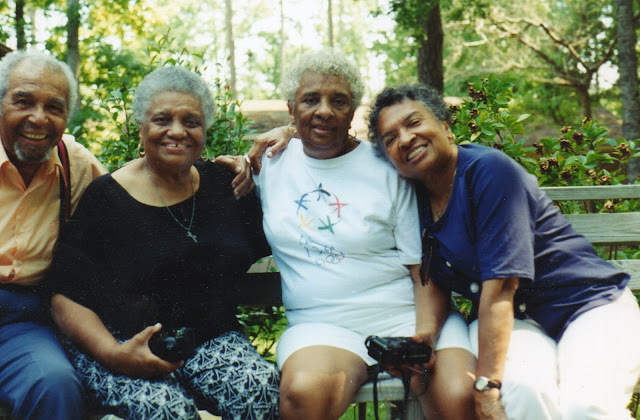 Ray Bryant, Mary Horton (my grandma), Rosa Sanders, and Eloise Grigsby. Summer of 1996 at Aunt Rosa's house. oooo, i love that photo, so much love in it. reminds me of my own family, my mom and her siblings. thanks for sharing. You are so right Angella, that there was a lot of love there. Miss them bunches. What a great family photo! This is a lovely photograph. I hope your grandmother and Rosa got copies of this photo because they both have cameras in hand and missed this shot. Thanks Linda! Yes they did get copies of this photo. I love this photo of your grandma and her siblings!!! This is fabulous!!!! Thanks Yvette! Yes it is one of my favorites.